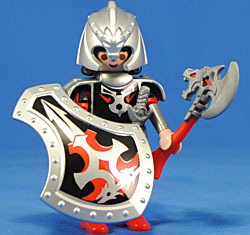 Playmobil released their third series of Fi?ures in the fall of 2012 but for some reason it was incredibly difficult for me to complete. However, after eight months and a hodgepodge of Toys R Us' and independent stores my set is finally complete! This third series of Boys themed figures is a noted improvement over of the first two with multiple "must haves" and I'm very pleased to see that each series has improved on what came before. This time out, the boys are packed in a black bag with silver radials. It's a decent look and definitely stands out among the previous series' but it's so dark in color it seems to lack the warmth and fun of the other types of packaging. Plus, it is a very stark contract to the light pink of the Girls Series 3 packaging. I'm sure was picked for its hipness, but here's hoping they go with more vibrant choices in the future. Also, as always, above the barcode on the back of the package are a series of numbers denoting production information that is occasionally helpful. 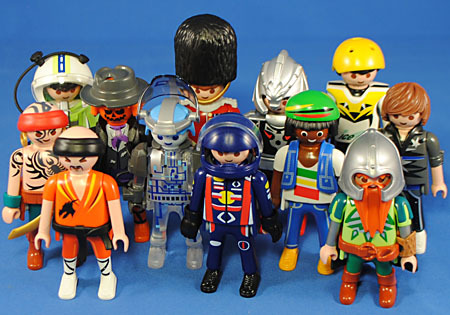 This assortment is number 5243 01 and in addition to that we get strings of numbers that can sometimes help identify the figure within the blind bag. But as we saw with the previous two releases, it's too infrequently helpful to bother sharing with you. Without any further ado, though - I give you Boys Fi?ures - Series 3! We begin with the ubiquitous Knight for the line. He's all decked out with the more fantastical and elaborate accoutrements of the Dragons line even so far as to use the same colors. While I normally love it when companies "continue lines" in these sort of 'various character' lines I have to say I'm not crazy about this. 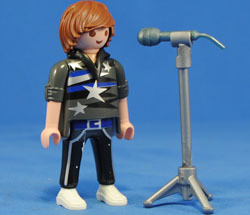 I am, of course, not a big fan of the "fantasy" version of Playmobil and without much of a color change this guy just doesn't stand out or seem special. He comes with a dragon-like helmet, an elaborate axe, stylized dagger and a neat big shield, he's even sporting chest armor similar to the Specials Samurai which is a pretty cool touch. 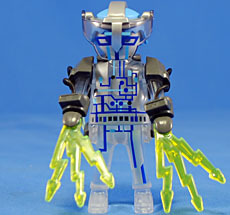 I just think back to the very colorful metallic blue blue Knight in the first series and wish they had done something like that here (like metallic green rather than silver) to really make this guy stand out. This is just... just a weird one. 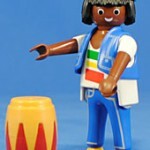 So specific and such a surprising and peculiar choice for Playmobil, but that's half the fun of collecting the line. Like all of their "clearly based on something" figures in this line this guy screams "rastafarian" to me. 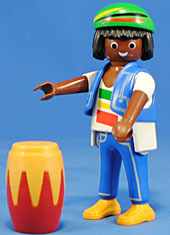 He gets a (green) beret and a small denim vest to rock his bongo/drum in peace and harmony with. The drum is a cool accessory and actually is two different pieces which come separate in the bag, so that may through you off as you feel your way through, as it did me. I'm not sure where in the collection this guy goes for me, he's so very "retro" feeling, but he's worth having for the novelty of a Rasta Playmo Guy. 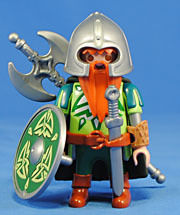 This is probably the most exciting figure in all of the Fi?ures line so far because not only is he something from real life that is iconic, he's also an army-builder! I love building armies, as you well know, so I'm very excited to see them take the first step towards fulfilling our dreams of army building. Alas, this guy is really just a guard (and was hard for me to find) so I've only ended up with two, which is good enough for me. He is completely awesome though! The big furry hat is a great new piece complete with golden chin strap. The rifle is a very detailed sculpt which I'm not sure if we've seen before but it is excellent regardless. What really pushes this guy over the top, though, is his dagger. It both fits in a loop on the back of his belt AND has a grove cut out of the handle so that it fits onto the rifle as a bayonet! Too cool! This is an absolutely flawless figure and is the pinnacle of what the Fi?ures format can achieve! I generally have zero interest in cars, racing and professional drivers but I'll be darned if this isn't one of my favorite figures in this series. 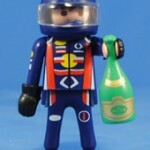 It's a very nice design, and really there is something about the rich colors and balance between them (and I'm including the champagne bottle in this) that really clicks for me (no pun intended [Playmobil figures are colloquially called Klickies]). The helmet is a simple piece but with enough little detailing to make it particular to car racing - which is cool. Plus, champagne bottle. Who here has a collection that COULDN'T use more champagne bottles? I'm tempted to get a second one of this guy just to have a spare bottle (perhaps for my Western saloon). Heck, I like this guy so much I'm a little tempted to get him a car to race! 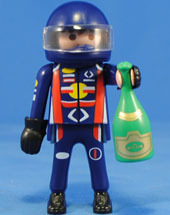 For cool figure, like the Racer, there is forgettable one like this. I just have no idea what they were thinking here. Not only did we already get a singer in Girls Series 2, wearing much the same thing, this is just a weird, weird, weird figure. I mean, it's just such a weird outfit. The colors suggest "down beat" while the stars and swooshes suggest "upbeat." The hair though makes it clear that it totally "isn't" Justin Beiber - kids these days... am I right!? At least he comes with a mic stand, and the use of the rolled up sleeves is nice, but all in all this is my least favorite figure in this series. 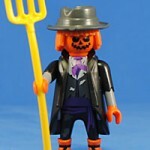 Scarecrows are awesome. Fact. I was really excited about this figure at first, but like the Grim Reaper he has just enough too much neon coloring to be cool or to be great. I love the torso, legs and arms on him - a lot - but boots, hands, head and hair all being the same shade of neon orange is just bizarre and a bit off putting. I really wish they would have done the boots in gray or some other clothing-based color, and either the hair should be straw-colored or the head and hands should be. I'd also be remiss to mention that I'm fairly bummed his jack'o'lantern face doesn't feature vertical lines suggesting it's a pumpkin - which really would have been amazing. As is, this figure is an 8 but with just a couple simple color changes he could have been a 12! 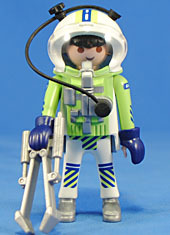 Still a great figure and well worth tracking down. 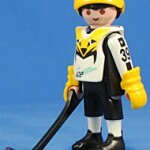 Man... Playmobil and their sports figures... they're trying so hard, bless 'em, but they just keep picking such odd and gaudy colors. Sure these are technically the same colors as the Pittsburgh Penguins but of all of the possible combinations out there they aren't the most appealing, and especially as done here it just looks like a BMX rider from 1984 put on ice skates. Removing color choice from the equation, this is is a fairly well done hockey player. I like his with-skates feet and I quite happy that he can hold his stick a couple different ways. 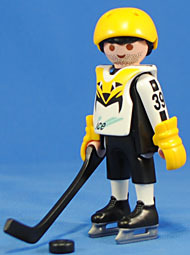 He even comes with a puck, which for some reason it never occurred to me he would have. 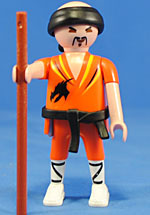 At first I was just bummed by this figure - "who needs another ninja, especially one in bright orange," I thought. But then someone pointed out it's a Shaolin Monk, and that makes all the difference. 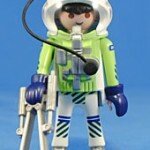 Sure, this is as good as Playmobil could do considering their figure format but all the key elements are there. 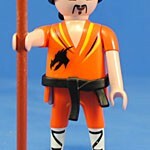 While that's very cool, I still tend to just see a generic ninja in orange when I look at this though. I really appreciate what they were going for, but it doesn't quite gel for me, alas. Awesome! Tron-ish digital robot man thing!? YES PLEASE! I may be wrong, but I believe this is the first time a Klicky has been cast in any kind of transparent or translucent plastic - and it's awesome! The "totally not Tron" circuit-board-y designs on him look phenomenal and I like the use of minimal bit of space tech/armor from the same failed Space line as the Spaceman above. 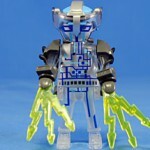 He gets with neon green lightning bolt accessories which are weird but oddly fitting for such an odd figure. The only downside here is that, oddly, his head isn't translucent. It makes for a jarring appearance and I think a clear head with the blue eyes/mouth inset would have made for a brilliant robot, but alas no such luck. He also gets light blue hair, which I think is a first as well. This is just a wildly cool figure, but in all honestly the opaque head does kind of ruin it. Still though, if you get only one, make it this guy - you can NOT get more unique than this! Playmobil used to have a sizable presence at Target but hasn't been seen there in about two years, so is this a brave return? A simple holiday trial? Who knows... but this did ring up as something from the Grocery department. 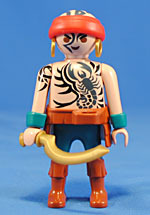 Well, the continued good news is that this guy was the Pirate who is arguably the best of the Boys Series 3, if not the whole of Series 3 (though I am quite eager for the Statue of Liberty)! 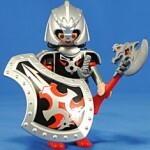 I love the color choices here, which is usually where Playmobil can fall short for me. It's a great balance of beige, red, green and brown with his dark tattoo and golden khopesh (or arakh, if you'd prefer [as I do]) adding some flourishes to keep it from getting too boring. He comes with a red sash/belt painted on his torso which is a great option should you choose not to used the brown waist armor reused from the Samurai Special. I love squids and octopi so these tentacled tattoos they're doing are right up my alley, and indeed I'm starting to hope they continue them as a sort of subline so that we can assemble a similarly tattooed pirate crew! This is a great figure and well worth the wait. All new legs! This is pretty cool and exciting - it's not every day they roll out a significant alteration to the Klicky format. 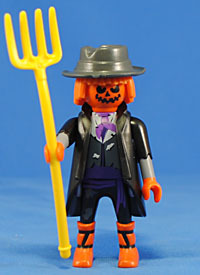 The legs are great short version of the regular ones, and I'm especially pleased that they are sculpted with boots on. This guy gets all of the armaments of a proper dwarf - helmet, sword, shield and long axe (from the old Death Knight Special). Whats even particularly cool about him is that he comes in the 'good guy' Celtic color and pattern schemes from the Dragon line. Unlike the Knight above this is the GOOD kind of carry over. The Dwarf works on his own but also fits neatly into that group while completely standing out on his own. 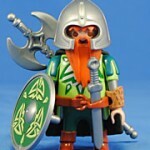 If Fi?ures is anything like Specials this could portend a relaunch of the Knights theme with a Dwarf sub-theme! That could be pretty darn cool, particularly if they don't go all ridiculous with the gaudy colors and over-the-top fantastical designs (I'm looking at you China Dragons theme) and especially if any mine-based sets can complement the Western mine! 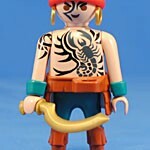 This entry was posted in Playmobil, Rustin's Spoils of the Week. Bookmark the permalink. Not-TR0N man looks awesome. So does the Scarecrow... I love the colors as-is. 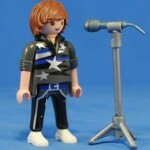 The Rockstar is probably a tie-in with the new Pop Stars line. 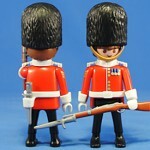 Can you please tell me where you are from or where you bought the figures. 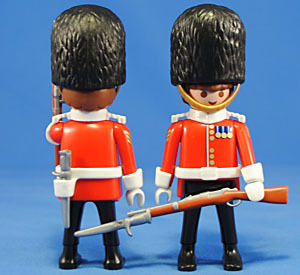 I am dying of the royal guard. Me and my sisters have a queen but no guards! Thought this guy looked awesome.